– a list, usually graphical, of the various credentials for an event and where they get you. 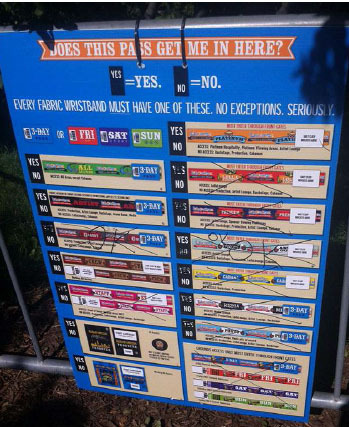 A common way to show these is to have a “YES” or a “NO” or simply X out the ones that do not work in any given area, so the security guard(s) can easily let or deny people in, with no grey areas. Below is an example of a patron / staff passboard.